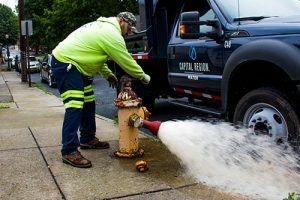 Capital Region Water will begin its annual fire hydrant flushing and inspection program on April 1. It is expected to take 6-8 weeks to reach all 1,800 fire hydrants in Capital Region Water’s service area. Hydrant Flushing Map: See where CreWs are flushing and what hydrants have been flushed. Fire hydrant flushing is a critical annual program to maintain high quality drinking water. Annual flushing removes buildup in fire hydrants and water mains and brings fresh water into pipes that are used infrequently. Every fire hydrant is also inspected for proper operation to ensure reliable use for fire protection. Capital Region Water quickly repairs any issues with fire hydrants to keep them in service. Over 70 fire hydrants were repaired or replaced in 2018. How will this affect your water service? Fire hydrant flushing may cause a temporary discoloration of water and a temporary reduction in water pressure. The discoloration is not harmful and can be flushed by running cold water through a faucet, preferably at the highest point in your residence. Check for discolored water before doing laundry when crews are flushing nearby. Flushing will take place in several phases and will begin near Reservoir Park and progress outwards to the service area boundaries. See where CreWs are flushing and what hydrants have been flushed. Capital Region Water will be using an automated phone system, Nextdoor.com, and Twitter to notify customers as the flushing program progresses. Sign up to receive automated messages about hydrant flushing by subscribing to “Service Alerts”. You can also sign up over the phone by calling Capital Region Water at 888-510-0606.